Previous blog posts in this series have looked at where and why those challenges arise, and what they mean for your launch plan and patient access to medicines. Now we move onto more specific challenges where pharmaceutical companies can really influence launch outcomes. Building a consistent and transparent launch readiness framework is at the top of the pile. 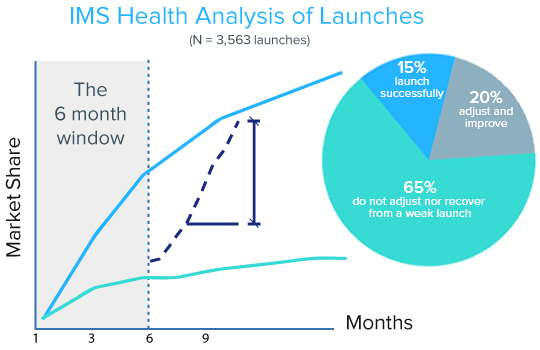 It can make all the difference between success and failure in a marketplace where, according to QuintilesIMS, 65% of product launches in pharma never recover from a weak start (see Figure 1 below). The barriers to market access are many and various, demanding input, understanding and alignment from a broad range of launch stakeholders. All of the teams had marketing groups involved in general market access activities at launch, while managed markets groups contributed in three quarters of cases. 62% of market access teams helped with launch sequencing, and all of the surveyed teams said marketing and managed markets groups were involved in this activity. 85%, 88% and 50% respectively of the teams involved market access groups, marketing groups and managed markets groups in product pricing. In an increasingly global market, companies should be looking for optimal alignment of launch strategy and execution to drive efficiency, effectiveness, compliance, consistency and best practice across countries, therapy areas, brands, management layers and functional siloes. At the same time, launch managers must be flexible enough to accommodate market-to-market variations in conditions for product entry and uptake. Cross-functional and transnational alignment, co-ordination, collaboration, information-sharing, and global-to-local flexibility, were front of mind for many respondents when TRiBECA® Knowledge asked 450 pharma executives what their biggest challenge was in launch planning. Once a suitable launch framework is in place, it must be understood, accepted and applied systematically throughout the organisation. This will help companies avoid issues that can derail even the most granular of launch plans, such as lack of clarity over timelines, budgets or key performance indicators. An early and proactive focus on developing value propositions, including health economics, and embedding systematic approaches to the pharmaceutical product launch company-wide is part of the process. Local affiliates must be carefully managed to ensure their attention does not drift from the launch plan. All available resources, both internally and externally, should be tailored as closely as possible both to the launch template and to local-market needs. All of this will run more smoothly and efficiently if the launch process, including key strategies, objectives, benchmarks, timelines, messages and materials, is made visible and transparent in real time across functional, cultural and geographical boundaries. As our survey indicated, many pharmaceutical companies still plan and track launch activities using traditional project management tools such as Excel and Microsoft Project. In many respects these tools are unfit for implanting and maintaining a consistent launch readiness framework across your organisation. For example, global teams have limited insight into how Excel sheets are used at local level. Without tracking tool usage and launch-related data in real time, they will squander opportunities to adjust the launch readiness framework promptly to key challenges facing the pharmaceutical industry as and when they emerge. A fully integrated, collaborative launch does much to illuminate and address market access challenges, and to ease the flow of a product roll-out across countries. With the right technology to embed and optimise this framework across your organisation, making it a living, breathing concern for all stakeholders in a successful launch, companies can turn theory into practice and give new products the support they deserve in today’s ever demanding marketplace. TRiBECA® Knowledge is a market leader in smart business tools that help pharmaceutical companies launch and commercialise products better by enhancing visibility, transparency, communication and collaboration across brands, management layers, business functions and countries worldwide.